Hey guys. This is going to be part two in my series “Learning the Letters”. Today, we are going to discuss the blank (referred to in the article as ?). The ? is by far the most valuable tile in all of Scrabble, primarily since it allows you to play bingos and use high point tiles lucratively. 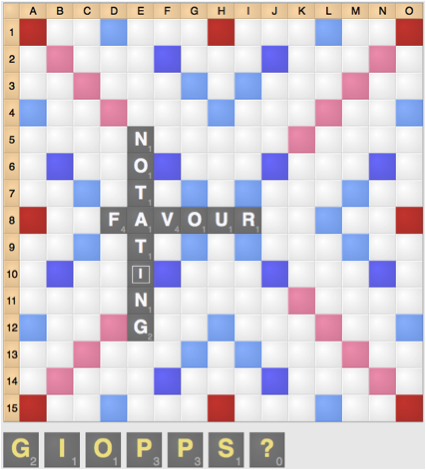 Drawing both blanks is a strong indicator of the player likely to win the game. As a general guideline, unless you are scoring at least 25 points (and often more), you should save your blank for a higher scoring play. That being said, the blank is also probably the trickiest tile to use correctly, as it tests ones anagramming skills. Many players struggle to find bingos with the blank, as the number of possibilities with the blank can be overwhelming. When looking for bingos using the blank, you should consider which letter you should make the blank. While the most common letter to make the blank is an S, you should also consider other letters, considering vowel-consonant ratio along with synergy. In the left diagram, you only have one vowel, so you should first look for bingos by making the blank a vowel. In the right diagram, you have the I and G, so making the blank an N for the ING combo should be intuitive. Here, this allows you to play OPPOSInG, or the highest scoring play, SOPPInG. Sometimes it’s worthwhile to actually forgo a bingo, particularly when you have a blank in your rack. Although the 50 point bonus for a bingo is substantial, with certain racks it’s worthwhile to forego that bonus to make a high scoring play and save the blank for a likely bingo on your next turn. 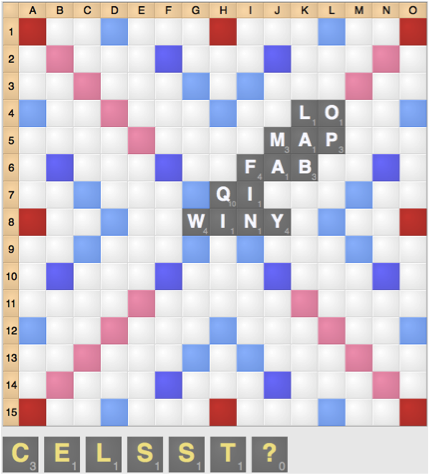 Here, playing FUSS o1 for 56 points is significantly better than playing FlUSHES l7 for 79. 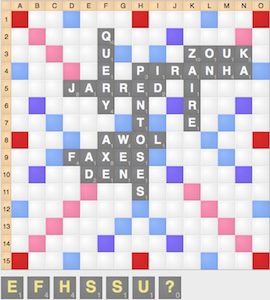 The blank is such a powerful tile that saving the blank is worth the 23 point sacrifice.